Will 2018 Be the Last Great Year for This Real Estate Boom? A new survey of housing experts and economists led by Zillow sees home prices rising 4.1% in 2018 before annual gains normalize at around three percent per year. So far this year, home prices have risen about 6.5% (through October), though this same group of panelists estimated a 5.6% annual gain on average. A year ago, the group expected home prices to rise just 3.61% in 2017 and 2.97% in 2018. In other words, they’ve been surprised by the exponential growth just like everyone else, and have constantly revised their estimates skywards. It reminds me of the mortgage rate predictions, which each year point to higher rates, and in recent years, have been wrong year after year. But as I warned with rates, they’ll eventually be right, and when that time comes, it could catch some folks out if they opt for an ARM over a fixed mortgage. Back in 2014, we were told that home prices would peak in 2016, yet another prediction we all know fell flat. That same forecast had home prices doing nothing for six years once they settled in during 2016. Oops. Wrong again. I don’t blame them – I think just about everyone felt home price gains were unsustainable back then, especially with the mortgage crisis only years removed. My sentiment was pretty similar, so throw me into that group as well. In the image above, you can see what surprised the pundits this year and what they expect next year. As you can see, they seem most confident about higher mortgage rates, but unsure about home price growth slowing. And low inventory seems to be even worse. Before you know it though, 10 years go by and you think, wait a minute, where did all the time go? The fast and loose days are long gone. 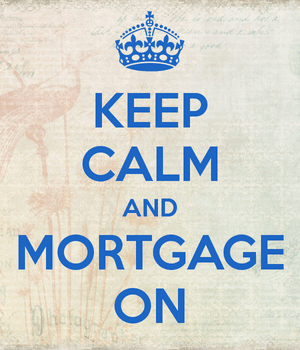 Underwriting is sound and today’s mortgage products are timid at best. But now what? How much life does this housing rally have left in it? What inning are we in? The top of 5th or the bottom of the 9th? Can we continue to defy gravity year in and year out? The answer might be yes, and it might not be as crazy as it seems when you factor in inflation. Remember, it has been 10 years. The dollar doesn’t stand still either, so the price you pay today is going to be higher than it was in 2006. Just like the things that used to be 25 cents now cost a dollar. Tried to play a video game lately? Hope you have four quarters handy. Same deal with home prices. As I wrote back in March, despite new all-time nominal highs, real home prices (factoring in inflation) were still some 33% below the 2006 peak. Back to that baseball analogy regarding how much more upside is left in this seller’s market, which many think will turn into a buyer’s market soon. Apparently, the housing market follows an identifiable boom and bust cycle that tells us the next housing market peak will be around 2024. Then shortly thereafter we might see another downturn, similar to how home prices peaked around 2006-2007, and then both real estate and the economy tanked a couple years later in 2008 and 2009. Ideally, the next housing market crash won’t be nearly as bad, but depending on what transpires between now and then, it’s possible we could repeat history. 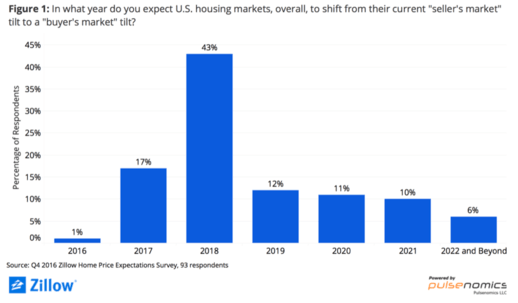 A Buyer’s Market in 2019? The image above is from last year. We know 2017 wasn’t a buyer’s market, and 2018 doesn’t appear to be either, despite the overwhelming support for that answer a year ago. So we push it forward a year to 2019. 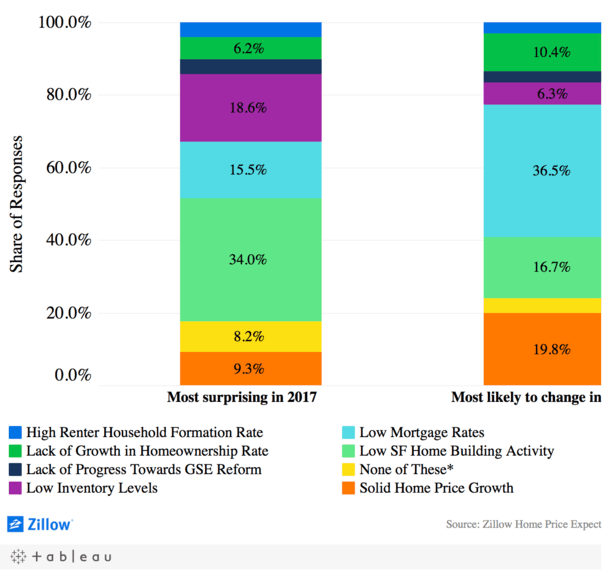 Zillow’s most recent survey of experts sees the housing market favoring buyers in 2019, though with inventory still abysmal, new home building largely absent, mortgage rates low, and forecast to remain low, the economy on what appears to be an upward trajectory, you have to wonder why. Some of the experts still predict close to 5% annual appreciation through the five-year period ending in 2022, which I doubt would surprise anyone. And those same experts expect mortgage rates to remain favorable, with the 30-year fixed climbing from around 4% to 4.5% next year, with the low-end prediction 4.28% and the high-end 4.70%. Even though you might be seeing a seasonal slowdown right down, with price cuts and stagnant listings, don’t expect home prices to be on sale in 2018. It’s typical for things to quiet down around this time of year, only to come back with a vengeance in spring and summer. This is great news for existing homeowners, who continue to gain home equity, but continued bad news for those still looking to get into the market, especially if rates also rise.